To date, Kevin Durant and his company has made nearly 30 investments. 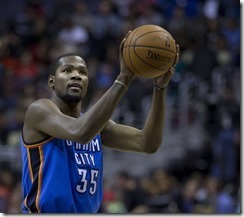 However, Durant and his partner were hesitant to call The Durant Company a Venture Capitalist firm. They look at it as more of an equity fund that places stakes in startups. Durant was asked how his way of doing business changed since moving to San Francisco, and he said that being right in the middle of the tech world was the best part of being in the city. Durant's partner, Mr. Kleiman, said the company doesn't chase startups. He added that there's no need to chase a deal if a startup doesn't take The Durant Company seriously or if they don't see the benefits of partnering up with the startup. He also said that everything needs to feel natural to both The Durant Company and the startup they partner with. In other news, Durant was asked about tweets that were deleted from his account. His tweets were about the Oklahoma City Thunder. The tweets were negative in nature and some thought that he was planning on tweeting from a second account. Durant didn't acknowledge that he uses two different accounts on Twitter. However, he did acknowledge that he did make the tweets. He said he took things too far and he acted like a child when he tweeted about his former coach. He also added that he is a fan of Twitter and he likes using the platform to interaction with fans. He ended the conversation by saying he didn't regret defending himself.